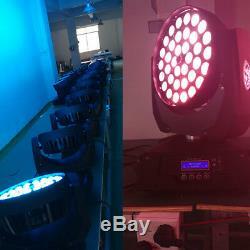 360W RGBW Zoom Wash Light LED Moving Head Licht Stage Bühnenbeleuchtung Lamp DHL. The following points have to be considered during the inspection. 1 All screws for installing the devices or parts of the device have to be tightly connected and must not be corroded. 2 There must not be any deformations on the housing, color lenses, fixations. And installation spots (ceiling, suspension, trussing). 3Mechanically moved parts must not show any traces of wearing and must not. 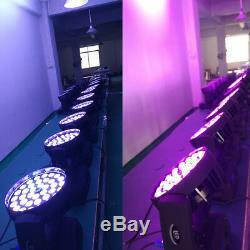 4The electric power supply cables must not show any damage, material fatigue. Further instructions depending on the installation spot and usage have to be. Adhered by a skilled installer and any Security risks have to be removed. 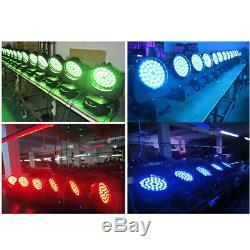 In order to make the lights in good condition and extend the life time, we suggest a regular cleaning to the lights. 1 Clean the inside and outside lens each week to avoid the weakness of the lights. Due to accumulation of dust. 2 Clean the fan each week. A detailed electric check by approved electrical engineer each three month, make sure that the circuit contacts are in good condition, prevent the poor contact of circuit from overheating. We recommend a frequent cleaning of the device. Please use a moist, lint- free cloth. Never use alcohol or solvents. There are no serviceable parts inside the device. Please refer to the instructions under "Installation instructions". WEEE & RoHS-Konformitätserklärung besttool888 verpflichtet sich, alle Anforderungen der WEEE-Richtlinie (2002/96 / EG) zu erfüllen. Wir versprechen, dass jeder Artikel losgeschickt hat. Aber machmal gibt es auch 0.3% Paket während transportieren zu verloren. Wenn dies passiert, nachdem wir dies mit dem Post bestätigt haben, werden wir Ihnen das Paket so schnell wie möglich nochmal schicken oder erstatten Ihnen sofort das Geld zurück. Unsere alle Ware sind Original und neu. Bevor wir Ihnen die Ware losschicken, werden wir die Ware absolute prüfen. Unseres Ziel ist, lassen Sie zufrieden sein. Wenn Sie die Ware nicht mögen und die uns zurücksenden möchten, sehen Sie bitte unten. Bevor Sie uns die Ware zurückgesandt haben, sagen Sie bitte uns zu ersten, dann werden wir Ihnen unsere Retourschein. Bitte senden Sei uns die Ware innerhalb 3 Tage zurück, nachdem Sie die Ware erhalten haben. Bitte bestätigen Siedie Ware wie original einpacken. Und Sie sollen auch die Rücksendungskosten tragen. Wenn Sie irgendein Problem mit dem Einzelteil, wenn Sie es erhalten haben, bitte zögern Sie nicht, mit uns Kontakt aufzunehmen. Wir bieten Ihnen die beste Lösung für jedes Problem mit dem Einzelteil. Wir würden uns freuen, wenn Sie uns freundlich in Verbindung, bevor uns eine Rücknahmeverlangen oder Verlassen negatives Feedback. Sollten noch weitere Fragen auftreten, bitte zögern Sie nicht mit uns in Kontakt zu treten, wir sind gerne bereit Ihnen zu helfen, um zu einem befriedigenden Resultat zu kommen. Sku:HG-SY-11 Features: 17 channels 50,000 hours lifespan Blue background LCD display Maintenance and Cleaning The following points have to be considered during the inspection: 1 All screws for installing the devices or parts of the device have to be tightly connected and must not be corroded. 2 There must not be any deformations on the housing, color lenses, fixations and installation spots (ceiling, suspension, trussing). 3Mechanically moved parts must not show any traces of wearing and must not rotate with unbalances. 4The electric power supply cables must not show any damage, material fatigue or sediments. Further instructions depending on the installation spot and usage have to be adhered by a skilled installer and any Security risks have to be removed. 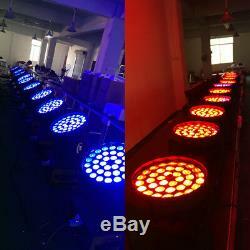 In order to make the lights. 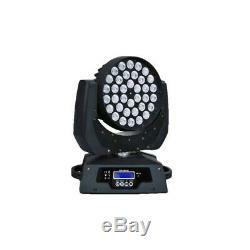 The item "360W RGBW Zoom Wash Light LED Moving Head Licht Stage Bühnenbeleuchtung Lamp DHL" is in sale since Friday, December 21, 2018. 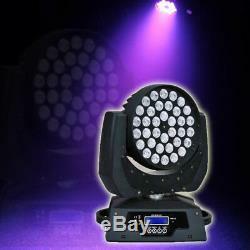 This item is in the category "TV, Video & Audio\Veranstaltungs- & DJ-Equipment\Bühnenbeleuchtung & -effekte\Licht-Effekte". 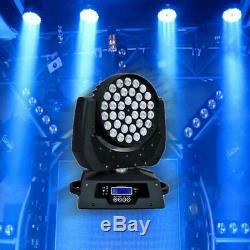 The seller is "besttool888" and is located in Basel. This item can be shipped to all countries in Europe.